Sri Lankan government under Prime Minister Ranil Wickremesinghe has decided to co-sponsor a roll-over of resolution at the ongoing 40th session of the UN Human Rights Council ignoring the stand taken by President Maithripala Sirisena. President Sirisena had requested the Government not to co-sponsor the resolution, saying he will request UNHRC not to dig the past and re-open old wounds rather allow everyone to live in peace. The President, yesterday, also named his own representatives to attend the session later this month. However, the Foreign Ministry said Sri Lanka will continue to demonstrate its commitment and determination towards a steady and long-lasting reconciliation process through a co-sponsored resolution. The Ministry said it will seek an extension of the timeline of resolution of 2015, which was further extended for two years in 2017. Sri Lankan government had co-sponsored a resolution in 2015 to address war crimes and bring accountability while its progress is to come up for discussion during the ongoing session. The government has been slow to act on its promises and there are demands to withdraw the resolution. However, the different stance taken by two pillars of the same government underlines the ongoing tension between the President and the government headed by the Prime Minister. Sri Lanka will continue to demonstrate its commitment and determination towards a steady and long-lasting reconciliation process through a co-sponsored resolution, and will seek an extension of the timeline of resolution 30/1 of October 01, 2015, through a co-sponsored roll-over resolution at the ongoing 40th session of the UN Human Rights Council. This initiative will further attest to Sri Lanka’s ownership of the implementation process and to its continued policy of constructive engagement and dialogue with the UN and bilateral partners. At the 34th Session of the Human Rights Council held in February-March 2017, the Government of Sri Lanka closely liaised with the core group (US, UK, Macedonia, Montenegro) to have the timeline of Resolution 30/1 of 01 October 2015 extended for a period of two years. Accordingly, as per resolution 34/1 of 23 March 2017, co-sponsored by Sri Lanka and adopted by consensus at the 34th Session of the Human Rights Council, the High Commissioner for Human Rights is required to present a comprehensive report, followed by a discussion on the implementation of Council resolution 30/1 at the 40th session of the Council. The action of the High Commissioner’s office on Sri Lanka is entirely based on this report which will be presented to the Council on March 20, 2019. A further extension of two years through a co-sponsored roll-over resolution accordingly needs be viewed in this backdrop. 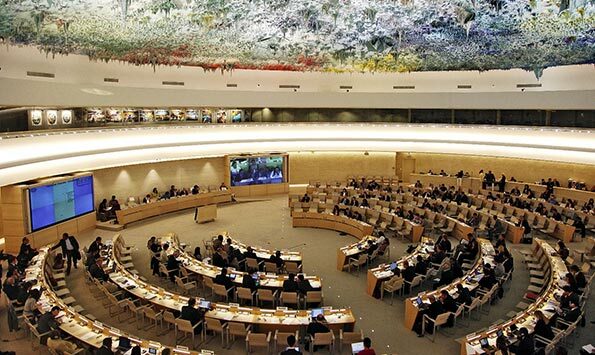 With the withdrawal of the US from the Human Rights Council, UK has taken the lead in the core group on Sri Lanka in the Council, with Canada and Germany joining the core group. Therefore, Sri Lanka will join hands with the core group leader UK in co-sponsoring this roll-over resolution. This Strategy will prevent international war crimes allegations being continuously leveled against Sri Lankans through strengthened ownership of the implementation process. The resolution of 2015 and subsequent efforts of Government of Sri Lanka follow as a sequence to the commitments given to the then Secretary General of UN HE Mr. Ban Ki Moon who visited Sri Lanka in 2009 by the Government of the then President Mr. Mahinda Rajapaksa. The following is the last paragraph of the Joint Communique issued by the Government of Sri Lanka and the UN at the conclusion of UN Secretary General’s visit to Sri Lanka in 2009. In the last few years the Government of Sri Lanka has taken concrete steps such as establishment of Missing Persons’ Office and Office for Reparations to establish long lasting peace and reconciliation in Sri Lanka in addition to the establishment of Independent Commissions, enhanced by the enactment of a number of enabling laws, including for the Right to Information. This led to the people of Sri Lanka benefiting from economic dividends, including in particular, EU GSP+ concessions. A few more laws will be introduced to strengthen the ongoing processes. The entire mechanism and process of reconciliation is under the control of Government of Sri Lanka. Those who shed crocodile tears on behalf of “War Heroes” of Sri Lanka conveniently forget the fact that our brave soldiers are right now engaged in peace keeping in Mali, a State in West Africa, and in other places. This became possible due to our co-sponsoring of the Resolution. Further, military to military cooperation has expanded considerably, with more training opportunities for Sri Lankan soldiers. The pride of our war heroes has been protected and the confidence of international community has been gained through owning up of the Human Rights Council process. We were able to witness this during the funerals of our two Army peace keeping soldiers recently. The draft roll-over resolution recognizes the strong role played by the democratic institutions in the peaceful resolution of the political situation that arose in Sri Lanka from October to December last year, which is a strong testimony to the independence, credibility and resilience of our national institutions. The allegations made against the co- sponsoring of the roll-over resolution by the GOSL is part of the campaign to mislead the public and gain undue political advantage. However, the general public of this country is aware how the Government came to power in 2015, and helped to avert a looming international catastrophe by co-sponsoring the resolution at that time. The current initiative is nothing but seeking more time for the GOSL to address the issues of reconciliation, peace building and national integration. For instance, the Government of Sri Lanka was unable to finalize some of the required legislation due to the infamous Constitutional Coup of 26th October, 2018.Those who try to seek cheap political advantages shamelessly of a situation in which the country needs to be salvaged are the real traitors of our Motherland.